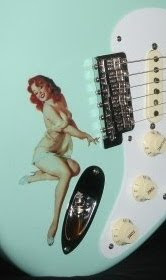 Eddie Vegas usually sticks with vintage Fender guitars, but he's listing this new 2010 FCS Sea Foam Super Relic complete with COA, OHSC and all candy. This Strat has 6105 frets, 9.5" radius and a "fat neck", and ships in orig. Fender carton. Contact Ed for more details!